Our dogs love us, but do we really know what’s in the “Heart of a Dog”? At a recent dog concert and screening of her documentary, Chicago-native and performance artist Laurie Anderson is on to something that other canine lover may have missed. There’s no doubt that my life is very canine-centric. My weekend schedule, my recent fund-raising activities and my daily life are all very much focused on my two current dogs, Kirisame and Kaminari, both purebred blue merle rough collies. I can usually tell what they want and what they need, but last month, I found I didn’t really know them at all, not like I’d know my friends and dance partners. I don’t know their taste in music. Laurie Anderson does know something about dogs. As a prelude to a special screening of her “Heart of a Dog,” Anderson led a special concert at the Cinefamily theatre in Los Angeles. The sold-out event was a last-minute addition to the Cinefamily schedule, only organized in a about two weeks. The dogs went through a screening process; our collies had Canine Good Citizen titles. The dog owners and their dogs queued up in a separate line from the non-doggie attendees. Dogs and owners were allowed in first, but asked to give up their doggie treats into a bucket. The reasoning was the same as in a free-for-all dog park: Dogs might fight over food. Yet after we were led into the back patio area, we saw there were doggie treats high on top of tables for pet owners to give their furry friends. All kinds of attendees came, from family who had just recently adopted an All-American mixed breed dog, to couple with an enthusiastic Bernese Mountain Dog to a self-assured slate grey standard poodle whose owner was dressed to color coordinate. The dog owners were allowed to be seated first. In the front rows of the theater, were various leather love seats, covered with blankets. Those sofas were given to owners with medium and large dogs. Small dog owners were seated at either side of the theater with their laps dogs occupying their laps. 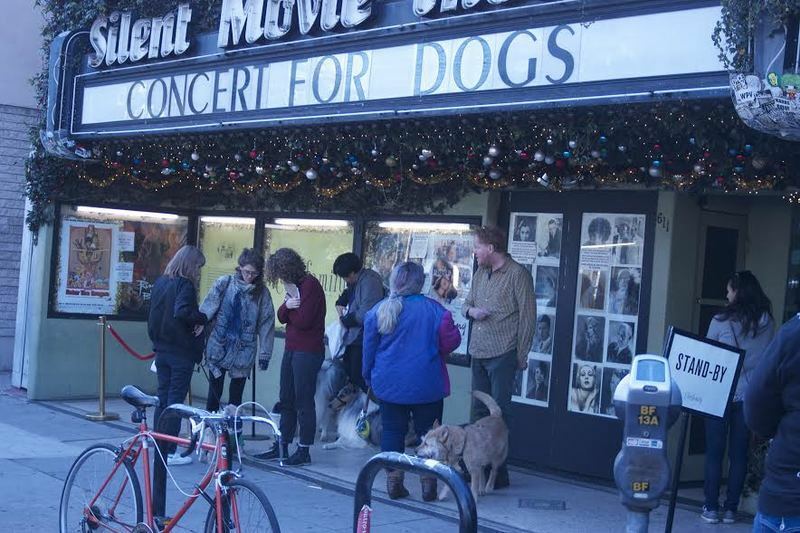 Cinefamily counted over 40 dogs; The Hollywood Reporter reported 60. Dog treats might not have been allowed, but human food was. Anderson is an American experimental performance artist and a dog lover. She has a short shock of brown hair and she wandered around the theater meeting the dogs with an open smile. She was willing to take cellphones and take photos of the guests and their dogs. This was her second concert for dogs. Her first had been an outdoor event in Sydney, Australia. Anderson studied the violin and played in the Chicago Youth Symphony, but she graduated from Barnard College in New York and then studied sculpture at Columbia University. We would have to settle for harp, sax, bass and drums. The sax played a piece that might sound familiar to marine biologists because it was “an invocation of whales” Anderson later explained. “Dogs like high-pitched sounds.”. I knew this. That’s why my voice is more attractive to dogs than humans. What I didn’t know was what melodies would make my dogs react. In Chinese philosophy, Kirisame would be yin, the more passive and laid-back of the two while Kaminari would be yang, bold and active. At one point, Kirisame sat with eyes focused on the band on stage, ears pitched forward and sitting straight up instead of his usual relaxed slump. Was it the sax? Was it the harp? I don’t know. Then on a particularly percussion heavy piece, Kirisame was relaxed and perhaps even bored, but Kaminari, who’s very name means thunder, joined in and barked in rhythm. No one frowned at this reaction. At the end of the short concert, we were encouraged to join in and howl. Anderson smiled and complimented Kaminari’s enthusiasm. “Heart of a Dog” is not just about her beloved companion, a rat terrier named Lolabelle, but also about the deaths of her husband, Lou Reed ( in 2013) and mother. We only see Lou Reed briefly in the 75-minute art film, and other rat terriers stand in for Lolabelle. Lolabelle had ordinary dog adventures and extraordinary, such as being threatened by a circling hawk in California. Perhaps that doesn’t happen to small dogs in large cities, but in California birds of prey and coyotes are known to view lap dogs as potential snacks. The movie also reminds us in a free flowing way that humans were also threatened from above with mention of the World Trade Center. There were people who told Anderson, “You just are going to have to put her down,” but Anderson resisted and explained, “It’s important to know your animal” and deciding to have your dog euthanized “is a very personal decision.” By playing the piano, Lolabelle could again reach out to people and “feel them around.” Lolabelle found a different way to play the room. According to Dog Relations NYC Lolabelle needed occupational therapy. If you look at the website for this "common sense counseling for dogs and their humans," you'll see Lolabelle as well as other piano-playing dogs. In the weeks following, we’ve tried different radio stations and various YouTube videos of tango and swing variations by violin, saxophone and harp. None have engaged our dogs like Anderson’s live concert. Anderson and Lolabelle had played dog concerts together and Lolabelle undoubtedly helped Anderson understand what sounds appeal to dogs. Belove is open to the possibility of having another concert for dogs. “We would be delighted and honored to do it again. I would have liked to do it outdoors in the summer.” Dog owners stay tuned. Anderson has since given a concert for dogs in New York at Times Square (Jan. 4th) and her "Heart of a Dog" will air on HBO on April 25th. The film is screening at Gene Siskel Film Center Jan. 25th at 7:45 p.m.